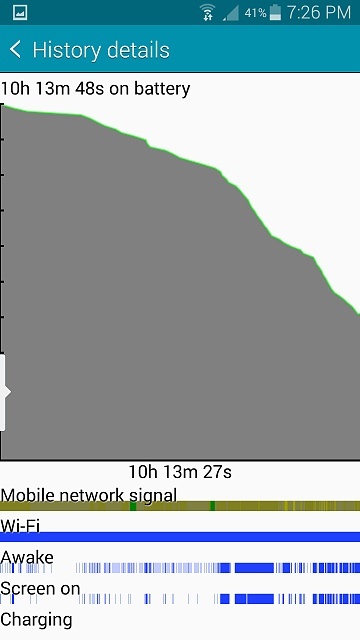 Solid WIFI line in the battery graph? So I'm not sure why this is happening and I think it is effecting my battery life pretty badly. I haven't seen this yet on any other screenshots and I'm not sure how to fix it as this is my first android device. I would love some tips to stop my phone from constantly using wifi. Go to settings menu - wifi, in the wifi settings, hit the menu button on top right, go to advanced. In that menu, there is an option to "keep wifi on during sleep". You can change this to only when plugged into power. Changing helps battery, but not by tons and tons. Wifi settings - advanced - uncheck always scanning and set keep wifi on to NEVER. You have over 10 hrs use and 41% battery left. Graphs, charts, etc. don't mean anything if you are getting this kind of battery usage. In my opinion you are making much ado about nothing. Whuuuut? We should get 86 hours of battery with everything turned on! But we are only getting 16 to 24 hours depending on usage! Seriously, your battery is good. The WiFi bar doesn't mean that it's being used, just that WiFi is On. Will I be able to install apps on SD card on the new Android Lollipop update? Built in data sleep feature? <SOLVED> Wifi speed drop ! Why won't my Samsung Trio Stealth 43BMID speaker turn off when headphones are plugged in?